Gosh I had a lot of fun with this one! I’m very privileged and excited to be featuring some more of the October 2018 release stamps and stencils! I’ve also included some of our old favourites just to mix it up a bit! Today I’ve gone for a mixed media edgy urban feel. It combines acrylic paint and ink. I cut this in half and used the other bit for another project. I also added some blue paint to the bottom. The main images including the sentiment were stamped using Versafine onyx black. I tried to line up the figures with the lines of the background stamp. I also dripped some magenta paint from the top to grunge it up a bit! After adding the splatters I added extra interest to the edges by randomly stamping parts of the elemental stamp and then hand drew some scribbly lines to create a border. YouTube: SUBSCRIBE to our channel for lots of inspiring video tutorials! We will be back later with some fantastic inspiration from Veerle! Hope all is well!! Today is my post for the Visible Image Design Team! I had a lot of fun with this card!!! Mark stayed with traditional colours for his first 2 cards. Our brilliant ‘Grungy Union Jack’ stencil doesn’t need much more than some distress ink to create a superb background! The awesome guitar from the ‘Music Speaks’ set was embossed onto black card using white embossing powder, cut out and adhered to the card using foam pads for depth. The ‘Father definition’ stamp was masked off to just use part of it, and stamped in Versafine black ink. Having masked his card in two parts, and coloured the left side blue using distress inks, he then flicked some water onto the ink. Mark then blended distress inks through the stripes part of the ‘Stars and Stripes’ stencil in red, on the right side of his card. Next he used some white texture paste through the stars part of the stencil, over the blue distress ink. The ‘Teenage Kicks’ stamp was stamped using Versafine black ink, cut out and again adhered to the card using foam pads. The Brother sentiment was masked off and stamped in black, and one of the definitions was then masked off and stamped below. On this card Mark stamped the trainers in pink and added some glitter to the toes! By adding some dylusions paint to the texture paste, the pink stars add a more feminine feel to the background, against the black distress ink. Mark then used a Wink of Stella pen to add some sparkle! Mark created a dark grungy background using Distress Oxide inks, splattered with water then dried. He then blended Black Soot distress ink through the fantastic ‘Play Guitar’ stencil. Mark double embossed the awesome guitarist from the ‘Rock Out’ set using silver powder and adhered it to the card using foam pads for dimension. 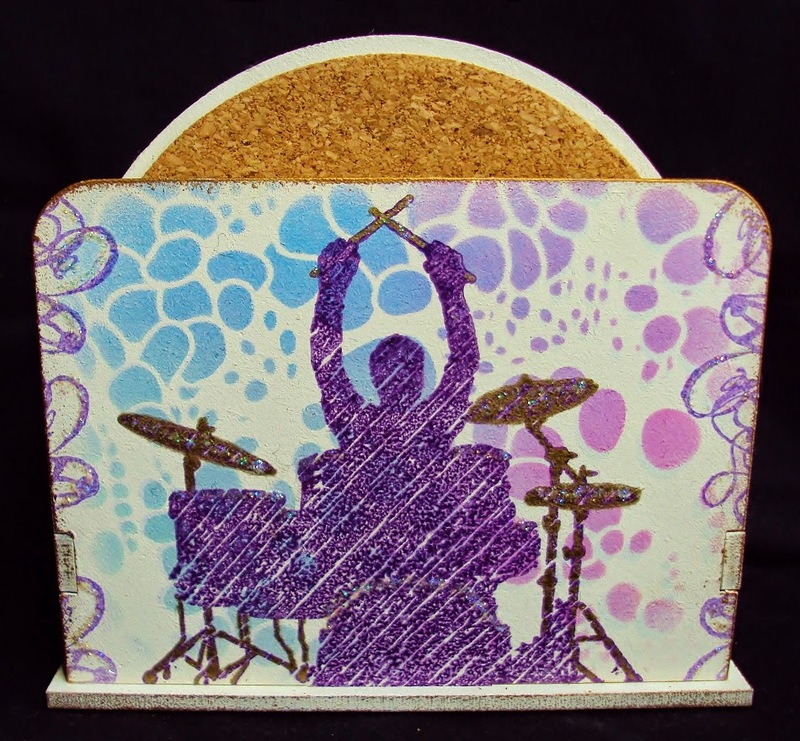 Super cool cards for teenagers and music lovers of all ages! Thanks for visiting our blog today, we’ll be back with more fantastic inspiration tomorrow. We had such a great time at Create and Craft at the weekend! Lots of sell outs which was amazing! If you tuned in.. thank you! The background is blended Distress Inks: Peacock Feathers, Picked Raspberry and Mustard Seed, flicked with water. I put the stencil over the top, and inked through it with Chipped Sapphire. I stamped the Son definition onto a piece of white card using Versamark, and heat embossed with Black Embossing Powder, I inked the edges, and placed the stencil on it, and inked through one guitar person, using Candid Apple. I went around all the edges of the background, and the definition with Versamark, and heat embossed with a silver sparkle embossing powder. 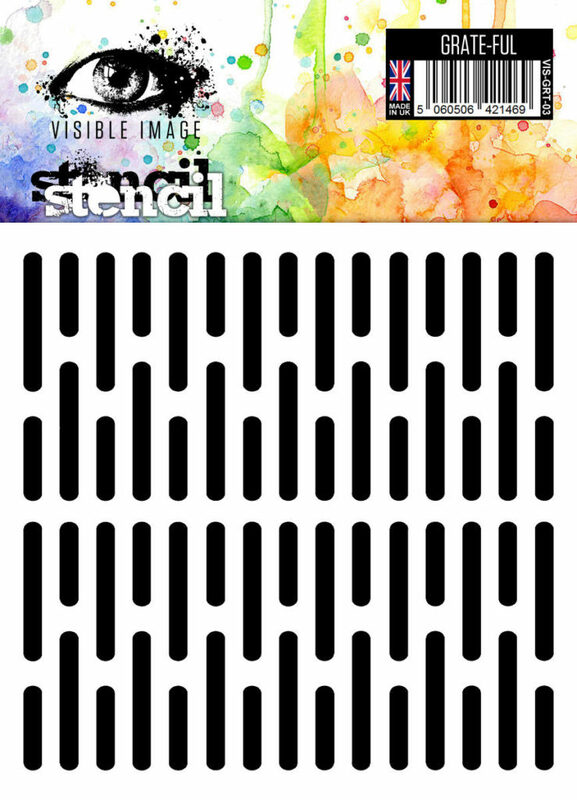 Want the chance to WIN a coupon to spend on our stamps and stencils??? Just enter anything you create with our stamps this month into our ‘Show & Tell’ album over in our Facebook group or join in with our themed challenge there too… this month’s theme is ‘distressed’. We will be back with awesome new inspiration from Nicky Gilburt later today. Welcome back for another thrilling Thursday inspiration post from me….are you feeling rotten?? I hope not, but poor Brian the Zombie is unfortunately!! He can’t quite reach the brains he needs either!! The background was created using Brushos and I stamped the zombie hands around the edge to create a frame. The brains are stamped in red and then clear embossed to create a shiny finish (which doesn’t really show in the photo)… I added blood drips using the Drag and Drip set of stamps, and suspended them on barbed wire from Molly’s set of stamps. Brian is coloured with Promarkers, and both he and the brains are mounted on 3d foam. Awesome card from Teresa! 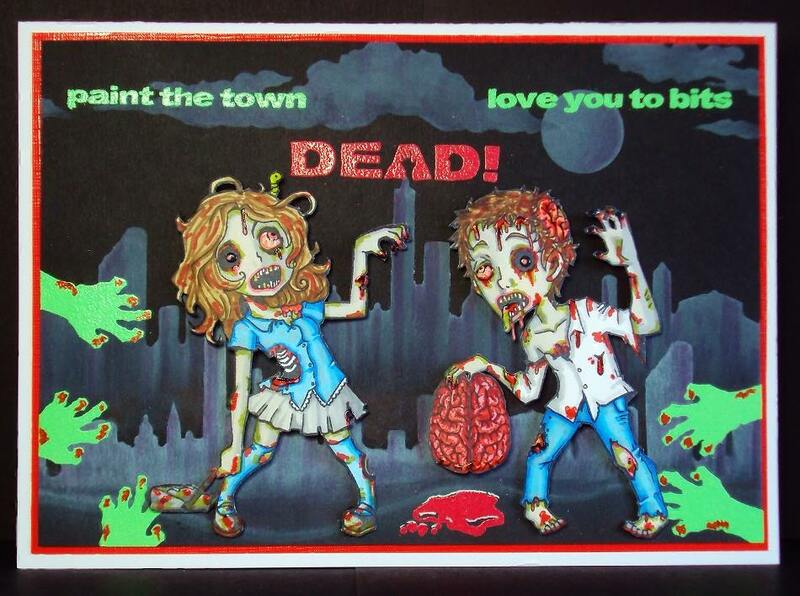 Any Walking Dead fan would love to receive this card if they were unwell! You’ll find more of Teresa’s work over on her blog. We will be back shortly with fabulous new inspiration from Elena. Hello again 🙂 Thank you for visiting! Today I am showcasing 2 cards I made using the really wonderful Robot stamp from Visible Image. You might already know that I ‘don’t do characters’ but once again Visible Image have designed a stamp that has drawn me out of my normal choice. Think back to their fab Tin Man and those pesky little Tweedle Twins, you can see why I picked the Robot Data set…. The first card I made uses the brilliant accessory stamps along with the Robot. 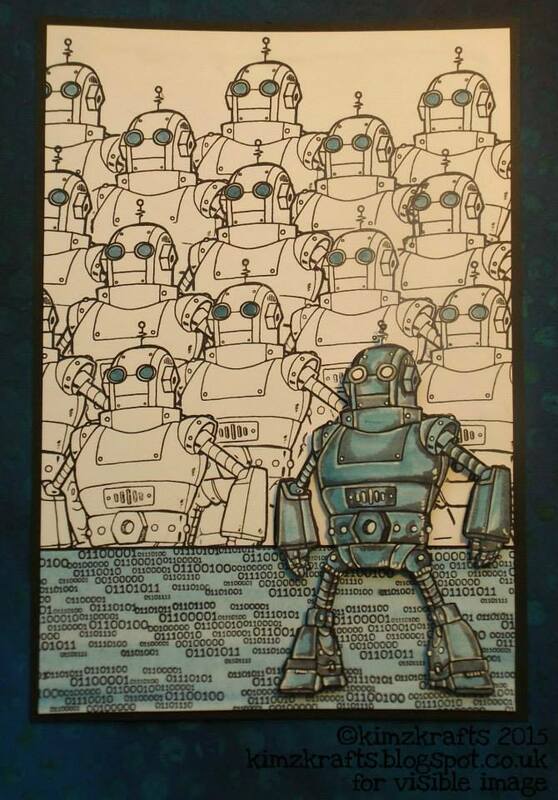 I used Brusho paints for the background and the robot. I also used Diamond Glaze on the Robot to give him extra shine. I used water to draw some of the colour off the Brusho background. The second card I made came after an idea I had one sleepless night! I have some of my best ideas during the night, insomnia is a devil sometimes. I had been thinking about these new release stamps and when I finally closed my eyes I saw rows and rows of Robots. Took some time cutting out the masks but I think the result is quite good even if it is maybe a little bit menacing! Click HERE to go to the Facebook group…Ask to join if you haven’t already. See you next week for another Marvellous Monday and in the mean time enjoy your week, get crafty and show us what you have been up to! You’ll find more of Kim’s inspiring work over on her blog. We’ll be back tomorrow with Sue Joseph’s latest Visible Image stamps inspiration. FIVE superb NEW characters that are so much fun to colour and create with! 3 awesome new character sets! Perfect for boys cards… and grown up sci fi fans everywhere!!! Especially for fans of ‘The Walking Dead’ and for those who have a ‘darker’ side! All these NEW character stamps are available to order NOW! Place your order for our NEW stamps between now and midnight on Sunday June 14th, and receive 20% OFF our new releases when you spend over £20! You will find all these gorgeous NEW stamps HERE! 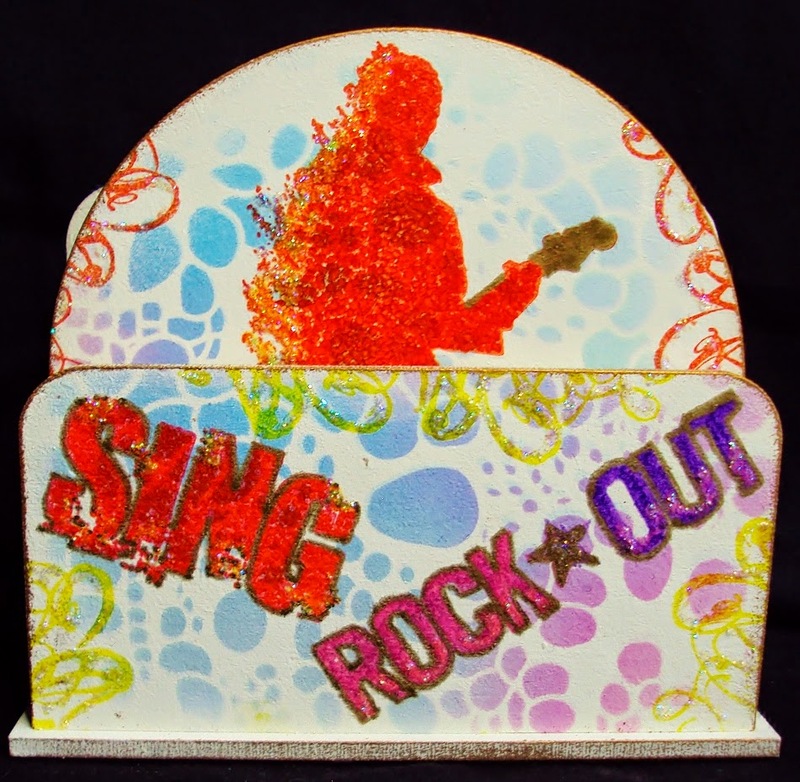 We have also released SIXTEEN new sentiment stamps to add to our Express Yourself collection! You will find the stunning Design Team samples HERE! Isn’t he ‘out of this world’ ?! Perfect for boys, teens and sci fi fans! There’ll be a chance to WIN some of our NEW stamps over in our Facebook Event, so come and join us there! Welcome back – are you excited about the new stamps coming next week? If you haven’t seen the sneaky clues then be sure to pop along to the new release event on Facebook which you can find by clicking here. I can’t wait to show you what I’ve been working on, but for now we will both have to wait!! This week I have made a card that would be great for any Rock music fan, and would also be a perfect Father’s Day card for all those ageing rockers out there!! I stamped and embossed the chain from the Max Rocks set of stamps using Versamark Ink and silver embossing powder to create a frame around the card. Don’t worry about trying to match the corners as these are hidden by the skulls. The skulls are from the same set, stamped with black Versafine ink onto white card and cut out. I added some gems to the eyes. I then stamped the skulls with Desert Sand Memento ink to create the background behind the drummer. The drummer is stamped with black Versafine ink, then I distressed the edge of the card and added some Black Soot Distress Ink. This is matted onto red card, then onto the embossed black card. The skulls are mounted on 3d foam pads. What an awesome card! Great design Teresa 🙂 You’ll find more of Teresa’s fantastic work over on her blog. Pauline will be here tomorrow with her fabulous Friday post! Trying some real CAS-cards today. CAS stands for Clean And Simple, like less is more. I’ve used the stamps from Rock Out on the brown card. I stamped the image with a brown inkpad on a kraft paper and chalked the edges. Super easy. For the next one I’ve used These are the moments and one of the circles from the Universal set. I found a bunch small rainbow inkpads that still worked and used them for the circles. Then I just stamped the sentiment in black. Embellishments: Enamel dots and die cutted cork. Medium: Rainbow inkpad, brown and black inkpad. You will find all the amazing Visible Image Design Team inspiration here on the BLOG. Come and JOIN the Facebook Group where you can enter our NEW ‘Show & Tell Challenge‘ for your chance to WIN some awesome Visible Image stamps! And don’t forget to LIKE the Visible Image FACEBOOK PAGE too. Two amazing CAS cards from Lisa! Stunning! You’ll find more of Lisa’s gorgeous work over on her blog. Would you like to join our team and inspire others with your Visible Image stamps cards and projects? Our Design Team call is open for applications until May 15th – you’ll find all the details HERE. We hope you will come back later on as Kim Robertson has a superb tutorial for you, creating an absolutely gorgeous card using melted embossing powder and our dragonfly stamp! Good Evening 🙂 Hope you had a good day… the long Bank Holiday weekend is almost here! Before I share today’s card with you, I want to let you know about our DT call. If you love working with different mediums, creating mixed media pieces, art journaling, scrapbooking, card making or colouring, then you might just be who were are looking for! On to my project for the day!! To create the background I stamped the Grunge Check with Versamark Ink and embossed with WOW powders’ Dull Matt Clear embossing powder. I then used Dylusions ink sprays and Distress Inks to add colour to the card, wiping any excess off the embossing powder. Once dry I used Ranger Sticky Embossing powder and silver blue foil to stamp the words across the top and bottom of the card front. Finally I stamped the guitarist and the words in the centre and embossed with black embossing powder. That’s all from me today, good luck if you apply to join the team….more inspiration on the blog from Pauline tommorrow!!! Amazing ‘man card’ Teresa! The foil technique is perfect for these stamps 🙂 Soooo funky! You will find more of Teresa’s brilliant work over on her blog. Hi There 🙂 We’re back with our second post today. Today I think I need some happy colors to stay awake. After a lovely crop over the weekend with my best friends I’m a bit tired. Bright happy colors from Dylusion Mists. Blended in water and dripped and dropped several times. Dried in between. Then I used stamps from Max Rocks Stamp Set that you’ll find here at Visible Image. 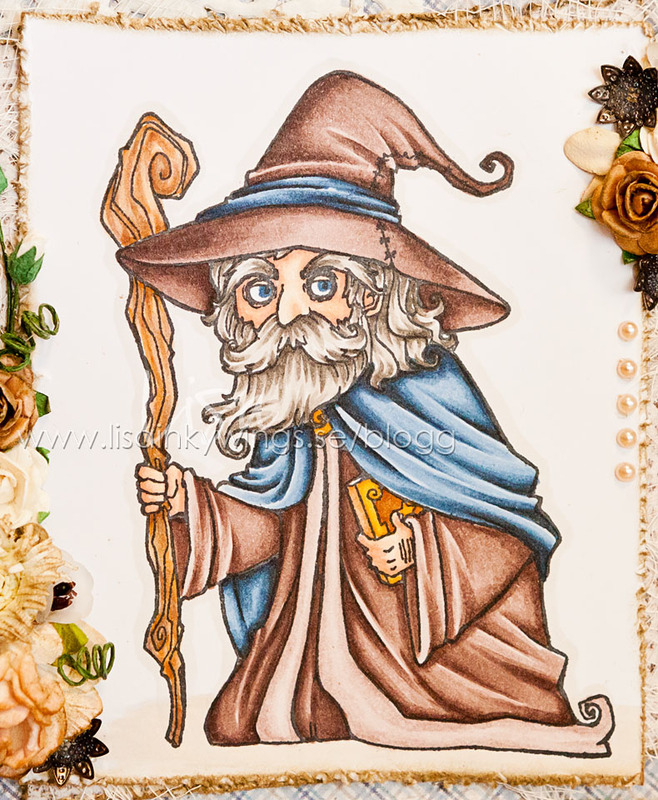 Max himself is stamped on watercolor paper and colored in with watercolor pens. I won them at the crop and had to try them out. Do you love Visible Image stamps? Right now they are looking for someone to join the Design Team. Please check out the Design Team Call! You will find all the amazing Visible Image Design Team inspiration over on the BLOG Homepage. Come and JOIN the Facebook Group where you can enter our ‘Show & Tell Challenge‘ for your chance to WIN some awesome Visible Image stamps! And don’t forget to LIKE the Visible Image FACEBOOK PAGE too. What an awesome card from Lisa! 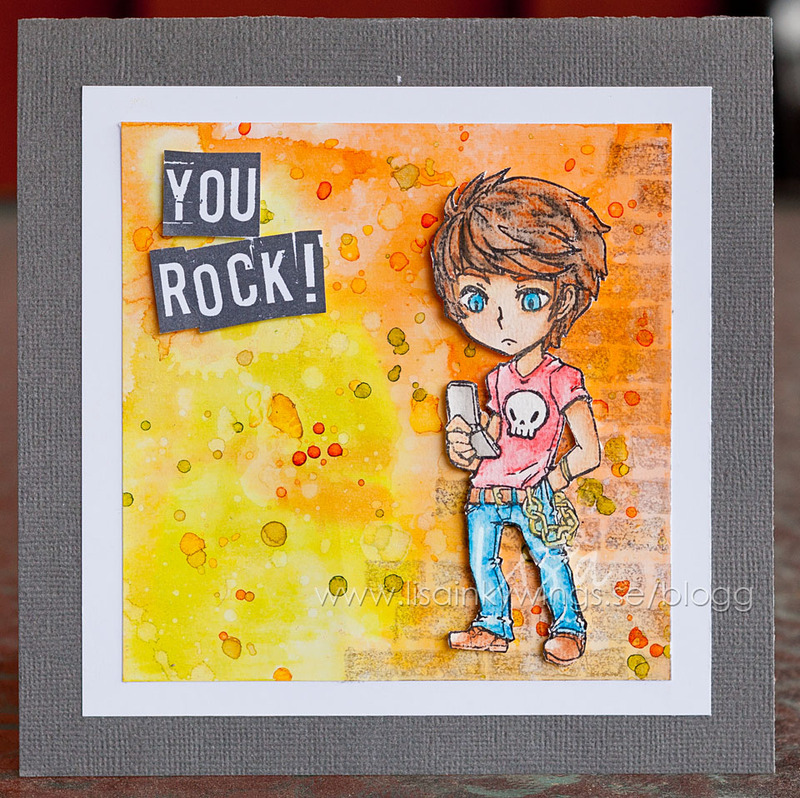 The watercolour effect is perfect for that slightly grungy look, great background too 🙂 You’ll find more of Lisa’s fantastic work over on her blog. Good Morning 🙂 Hope you have a fabulous weekend planned! Today we start our weekend of giveaways, spot prizes and competitions to celebrate reaching 3000 likes over on our Facebook Page! More details later on in today’s post. Creating my own patterned paper with stamps is one of my favorite “techniques.” To create this card, I used stamps from Molly Rules, and Jake Skates. I love the little skull stamp! Don’t forget to join in on our April Show and Tell challenge for your chance to WIN some awesome stamps! That’s all for today, thank you for stopping by! This is such a fun card! The extra stamps that come with our characters are perfect for making your own patterned papers! This is a super cool teenage card 🙂 You can find more of Amber’s fantastic work over on her blog. We are so excited that the love of our stamps is growing far and wide.. with new customers all over the world, and more & more shops stocking us too! This is our way of saying ‘thank you’. See you over on Facebook! Good Afternoon 🙂 Thanks for coming to visit. Today I have two cards for you with stamps from Visible Image. The first one was meant to be for last week, but my internet died and I had no chance to get it up. It was almost going to happen again, the internet was away all day yesterday for me, but was back late afternoon. Phew. Elegant Emma is first out on a CAS-card. Classic clean and square – perfect if you don’t like details. The second card is kind of opposite. Lots of details, layers and decorations. It’s fun to do both styles. 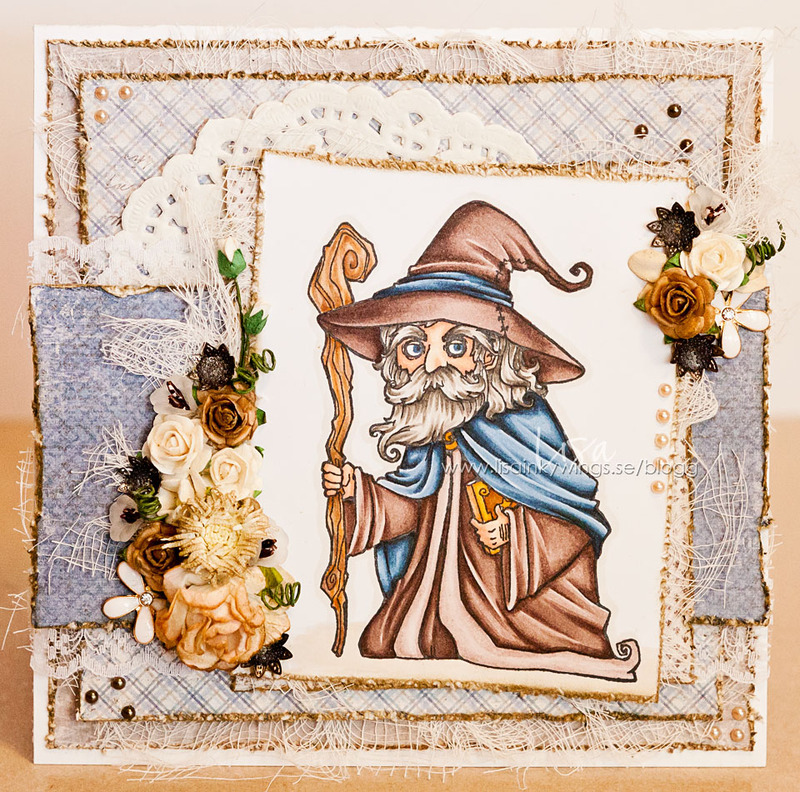 I’ve used Myrddin from the Myrddin Magick Set. The edges are distressed and inked and lots of cheese cloth to add texture. You will find all the amazing Visible Image Design Team inspiration over on the BLOG Homepage. Come and JOIN the Facebook Group where you can enter our NEW ‘Show & Tell Challenge‘ for your chance to WIN some awesome Visible Image stamps! And don’t forget to LIKE the Visible Image FACEBOOK PAGE too. Two stunning cards from Lisa! Amazing colouring! You’ll find more of Lisa’s gorgeous work over on her blog. We will be back again later with a brilliant tutorial from Kim Robertson showing you a fantastic technique! Today I’d like to share a set of Coasters, from Candy Box Crafts Ltd., that I’ve decorated, using the new unique Music stamps from Visible Image. These were a sample for my Inky Workshop 3, the results of this fab day are on the post below, do take a look. The stamps I used for these coasters were………. Feel The Beat, Sing, Rock Out, Jazz it Up, Play it Loud and Soul Music, the little edging stamp is a sneak peek of the Visible Image freebie, it’s out very soon in the May issue of Craft Stamper. I painted all the components with a neutral base colour acrylic paint, used a stencil from my stash with distress inks for the background, then stamped the fab images on to each coaster using the very bright Oak House Studio ink pads, I completed it with a dash of a Gold paint pen, Stickles and some Treasure Gold gilding wax. There is still loads of time to get your Visible Image entry into the ‘Show & Tell’, for a chance of winning some new stamps of your choice, take a look HERE. 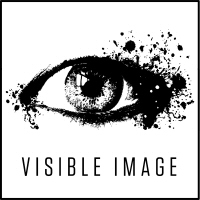 Pop along to the Visible Image Facebook group to see all the news, and lots of inspiration HERE. These are AMAZING! So cool and funky! You will find more of Pauline’s fabulous work over on her blog, with more photos from her inky workshop. Have yourself an awesome Friday! We are off to see Spandau Ballet tonight… so excited! The Wonderland range of stamps from Visible Image have been a massive hit and everybody is loving the characters, including me!! I layered the faces and name tags using 3d foam, adding a bit of twine around their necks for extra detail. They are coloured with Promarkers and the background was created with a mask and Black Soot Distress Ink. For my second card, I used the circle design stamp from the Universal set as my background design (love this set, it is so versatile, and a ‘must-have’ in my opinion!) I stamped the brush stroke design from the Drag and Drip set and added red embossing powder, then stamped the sentiment on top with black StazOn ink. Again, the characters are coloured with Promarkers, and mounted on 3d foam. I hope you have been inspired today, don’t forget that we run a Show and Tell contest on Facebook every month giving you the chance to win some scrummy Visible Image stamps. We love to see your creations, whether you are a complete novice or an experienced crafter. Thanks for coming to visit us today. Pop back tomorrow for fabulous Friday with Pauline! Hi! We are back with today’s second post. It’s Wednesday and I have a card for Visible Image to show you. I’ve used Orin Destiny set this time and it comes with 4 stamps. You can see 3 of them on my card. With this kind of image I didn’t want to make the card too cute, so I skipped the flowers this time. The words come together in one piece and I haven’t cut them apart. I just masked the part off with post it notes that I didn’t want to have ink on when I stamped. Very smart trick! Other: Inka Gold on corners. We will be back this afternoon with some Wonderland inspiration from Teresa Morgan. Blogging a little earlier today… before I get too engrossed in today’s tasks! 3 days and counting until we leave for the trade show and much to do! Today we have some fab and funky inspiration from Lisa, and a little later we will be back with NEW stamps inspiration from Kim R.
Last time I colored Molly I knew I had to try her in another hair color, and so I have for today. It’s my Wednesday at Visible Image. All three stamps are from the Molly Rules set. Papers: Basic Grey + ? You will find all the amazing Visible Image Design Team inspiration over on the BLOG homepage. Come and JOIN the Facebook Group where you can enter our NEW ‘Show & Tell Challenge‘ for your chance to WIN some awesome Visible Image stamps! And don’t forget to LIKE the Visible Image FACEBOOK PAGE too, where you will find a fantastic GIVEAWAY this week! See you later! Thanks for stopping by. Pop over to our Facebook PAGE and give us a LIKE 🙂 Tell your friends about us… and mention us to your favourite craft shop too! Just imagine being able to pop and in see our stamps hanging there for you to drool over and maybe even stroke!!! A beautiful feminine card, a great masculine card and a super cool teenage card featuring our Molly Rules character stamp! Gorgeous words don’t you think? See you tomorrow with our Marvellous Monday post from Kim Bacon! And don’t forget to spread the Visible Image LOVE! Hi! This is Max from the Max Rocks stamp set by Visible Image. Perfect for a cooler card to a boy. I made this card a bit clean and stylish since it’s for a boy. OK, I know – boys CAN love flowers too, but this time, I choose not to add a bunch of flowers. Actually the only decorations are the sculls, and they are stamped and cut out and just put on foam dots. I added the bricks just at a few places in a light color to give a hint of a brick wall behind him. Almost as a decoration. 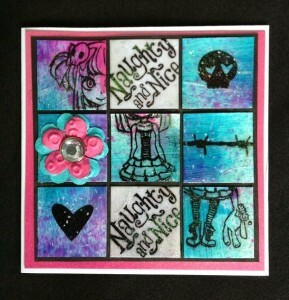 Embellishments: Net, Cut out skulls from stamp set. Don’t forget to check out on the new sentiment stamps. Perfect for Valentines Day or anniversaries, birthdays etc. Come back tomorrow for more fantastic inspiration from Teresa Morgan! Today is my weekly post for Visible Image Stamps. I haven’t made a CAS card in a while and I do so love a CAS card 🙂 So today’s make is just that! I used Orin, from the Orin Destiny set and coloured him in using my Promarkers. I then stamped the sentiment from The Cowardly Lion Set onto a card blank, in the top left hand corner. I would normally stamp the image on the same layer too, but i already had Orin stamped out, plus i was originally going to hang part of the edge of his cape off the edge of the card, but i think i used a blank that was a little to big, as when i hung his cape off the edge, Orin looked to far away from the wording! Orin is mounted using raised foam pads. Don’t forget to check out the blog for more amazing DT inspiration. Don’t forget the awesome November Challenge where there’s a chance to win an amazing prize of a £20 spend on Visible Image’s superb stamps. Thanks again for visiting today 🙂 Have a great Sunday. It’s ‘Soozie Tuesday’ here at Visible Image stamps! 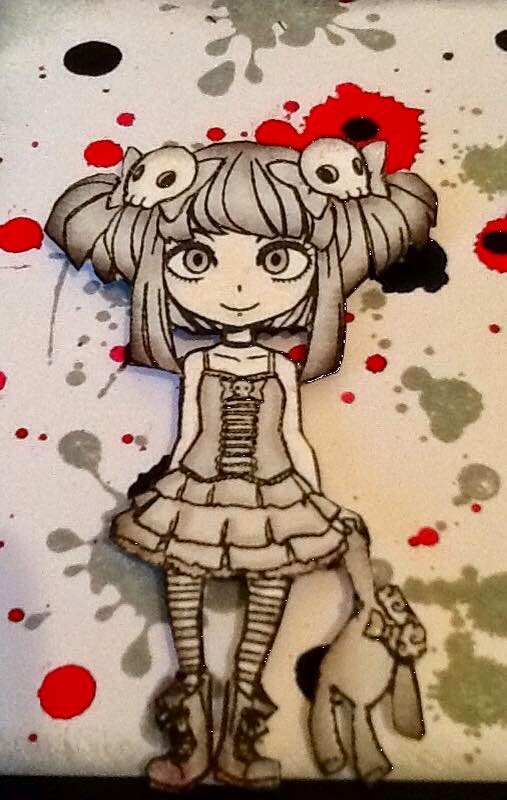 I coloured her in with my promarkers after stamping her in memento tuxedo black ink. Unfortunately the picture isn’t picking up much shading or the sparkle on her dress and bows. I clear heat embossed her boots and pupils too, then fussy cut her out. For the background I used iced spruce distress ink and the Ink splats stamps and the paint splat from the painted wood set and I used a pipette to drip some red and black ink on. 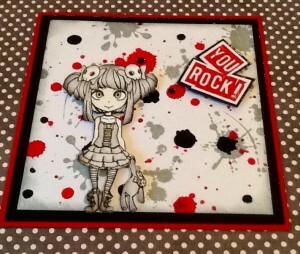 Matted onto black and red card and added the awesome ‘You Rock’ from the ‘Max Rocks stamp set’ love this and I heat embossed it in wow primary apple red and matted on to black card. I attached this alongside Molly with dimensional pads. facebook group just mention its for the challenge, you’ll also find all the latest news here too. Well folks, thanks for popping over, hope you like my creation for this week. Visible Image character stamps today! We hope we’ve inspired you…. and perfect for all those cards you need to make! Molly is still proving to be our best selling stamp set! She’s just so perfect for teenagers…. right through to women in their forties! A NEW card from Sue! with a fab little stamp from our Jake Skates Set. Awesome card from Cathy showing just how cool the Molly Rules set is! Such a funky design here from Julie! Loving the barbed wire frame on this one from Sue! which matches up perfectly for repeat stamping! and our Ink Splats stamps make brilliant graffiti! Brilliant pop up card from Julie. Fabulous bows and net skirt! You can have SO MUCH FUN with our Molly Rules Set !!! How fabulous do the skulls look here all sparkly with glitter and gems! Nice work Kay! Molly is rocking that blue hair! Love this lime green and black colour scheme! on this awesome card by Sue! Another brilliant design from Julie! How cool is this card from Cathy! Very funky!!! who was nicknamed Pinkie because of her extreme dislike of the colour!!! Gorgeous card from Cathy, love the colours and the background looks amazing! How awesome is this for a pressie?! works perfectly with Molly too! Sue can make you one of these for a Christmas present! Sooziekoo cards for more details! Make some different and awesome teenage cards! to show us what you’ve created with her! There’s a HUGE £20 to spend on our stamps up for grabs!!! Come and join for more details! Thanks for visiting the Visible Image Stamps Blog today! Have yourself an awesome day!